The idea is to have a week night to dance, network, nourish and relax and sooth tired bodies. Combining what we love to do feed people and dance with them. 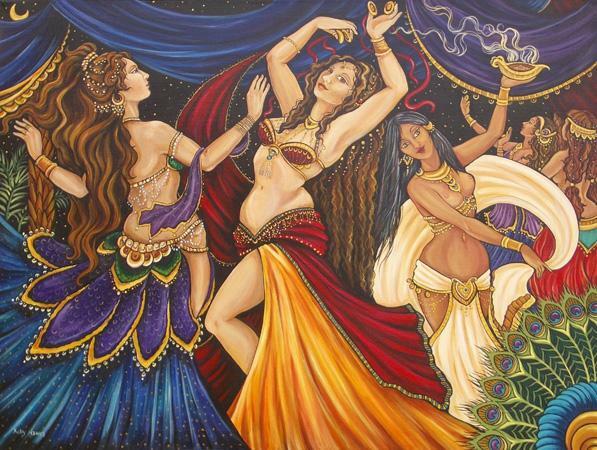 A Ladies Night of Belly Dance for experienced dancers..
You need to reserve in advance! Call or email to reserve and send in payment. or $30 online with a credit card. Followed by Hot Tub Spa relaxation or sit and talk while you peruse belly dance magazines and books from Delilah’s library. Work out attire or costume. Bring a robe or towel! And a change of clothes so you don’t have to put your sweatty clothes back on. A bit of cash if you want an extra beverage. Dinner Time: 8:15 join us for a sit down dinner prepared by Erik Brown. Enjoy appetizers, main course, dessert tea or coffee and girl time! Menu for Oct 2nd: VEGETARIAN NITE! Other beverages available. We ask for a contribution please. These Hafla’s are scheduled for dancers with some belly dance experience. However if a group reservation for 5-6 new dancers is made the course will be taught to accommodate beginning level. Let us design a party for you! What fun for a special celebration among a group of close friends. Reserve a special night group reservation for 5-6 beginners like Eat, Dance Soak. The course will be taught to accommodate beginning level with addition of party props, favors and a performance. (can accommodate more as a buffet and round robin in the hot tub for larger parties. This can make a fun get together for a small group of friends celebrating a birthday, wedding or baby shower or just because it’s fun!